Eliminate stubborn wrinkles and creases with the Tefal Ultragliss Steam Iron. Thanks to its Durilium soleplate, this iron efficiently distributes steam and glides across your board seamlessly.The Tefal Ultragliss Steam Iron features up to 40g/min of variable steam and is capable of a powerful 145g/min turbo steam shot so you can easily deal with tough clothes crease.For added safety and ease of use, this steam iron has an automatic shut-off feature, extra stable heel, and a comfort handle.Ultragliss shoots steam vertically, letting you iron curtains or delicate garments like pants and coats on a hanger. 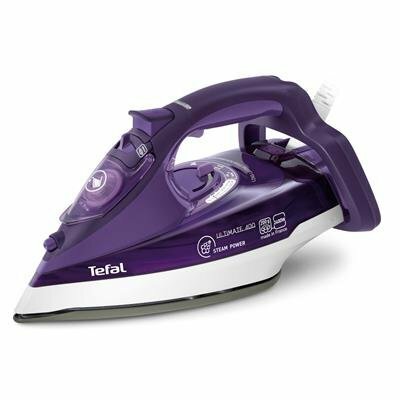 The Tefal FV4921 Iron was added to the Irons category in December 2016. The lowest price GetPrice has found for the Tefal FV4921 Iron in Australia is $98.00 from Bing Lee.